When Travis and I started dating, he bought me a bike. In an effort to confuse and mislead him, I tried to enjoy riding bikes with him. We even had a kinda bike-themed engagement shoot (meaning, we had bikes in some of the pictures) and bike stamps on our wedding invites, and we pedaled away from our wedding reception on a perfect, yellow bicycle built for two. We biked to and from the water park, the grocery store, school and everywhere (especially after we sold our car to go to Africa). And then, I got pregnant with twins. And that was a perfect excuse to never ride a bicycle again. A few years ago for Christmas, Santa brought the boys wooden balance bikes and they hated them. In three years, they almost never rode them. They eventually fell apart (literally) from sitting in the rain. So we were like, "Whatever. Sorry. We're not a biking family." And now they have bikes. The boys are up at the crack of dawn (literally), begging to go outside and get on their bikes. 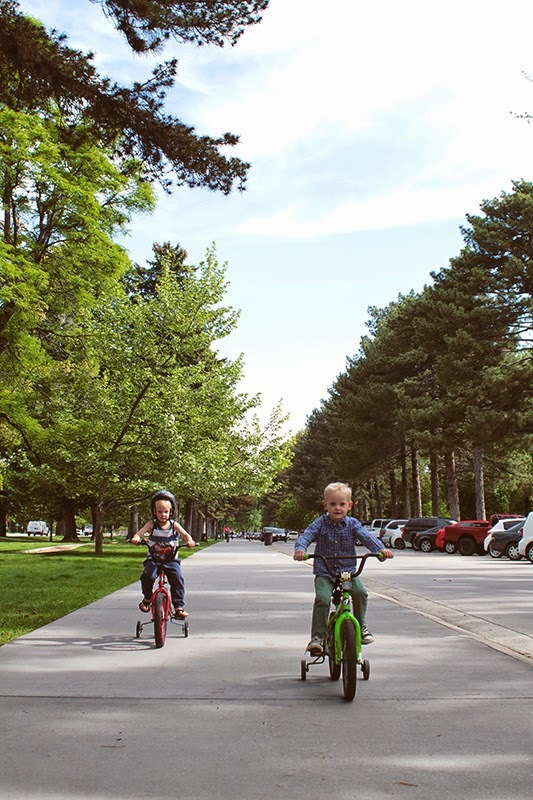 Anytime we leave the house, they want to bring the bikes in the car so they can ride when we get where we're going. Travis took them to the park and they biked around and around- probably a couple miles all told! It's everything he ever hoped for! I'm glad that they can fulfill his dreams of family bicycle time so I don't have to. Although, it seems like maybe it's time I got a little bike that I can pedal alongside them at the park, because goodness knows- I'm not going to jog after them. A note: They dressed themselves. Micah in a tank top, sweat pants, and Batman helmet. Grey in a button-up dress shirt, no helmet, and classic Converse. Two cool dudes.